Kathy Walkup began by showing an iconic photograph in the history of printing. Taken in Ireland at the Dun Emer Press in 1903, it shows Elizabeth Corbet “Lolly” Yeats, dressed in a full-length smock, at work at an Albion hand press. Two other similarly dressed women share the print shop, one preparing ink and the other sitting at a table in the foreground, checking proofs. Walkup pointed out that while this image is often seen as an example of genteel ladies keeping themselves occupied with a “suitable” art, this interpretation is far from the truth. Elizabeth Yeats was no hobby printer. She and her siblings W.B., Jack, and Susan Mary “Lily” Yeats, were called upon to support themselves and their father, the Irish painter John Butler Yeats, who failed to provide for his family adequately with his portrait painting. Living for a time in London, the Yeats family was part of William Morris’s circle. Lily did embroidery for May Morris, and it was Emery Walker who suggested that Elizabeth study printing as a way to find gainful employment. 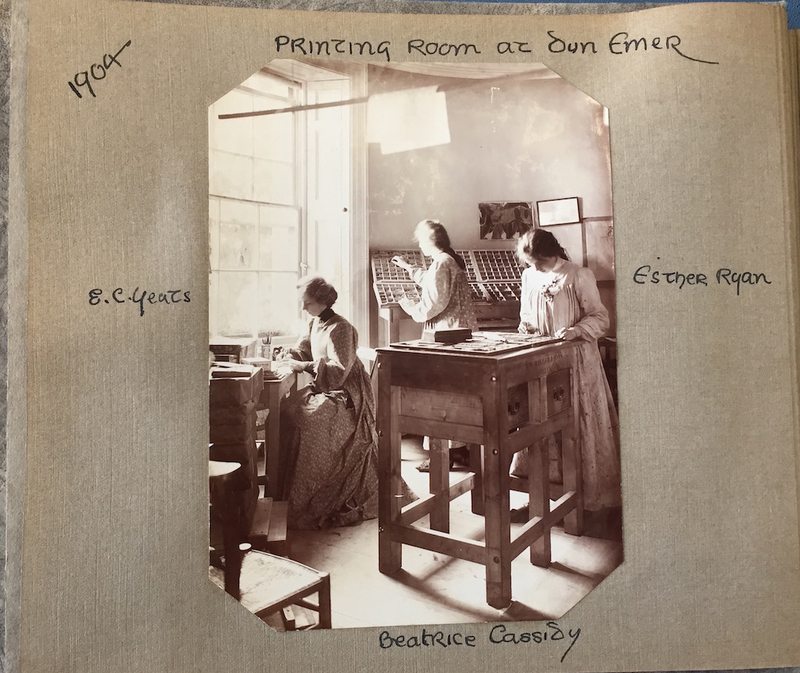 She briefly attended the Women’s Printing Society and when the family moved back to Dublin, Elizabeth was invited to be the printer for the Dun Emer Press, part of Dun Emer Industries, formed by Evelyn Gleeson. The Dun Emer Press transitioned to the Cuala Press in 1907 when Elizabeth and her family broke ties with Gleeson. Elizabeth’s brother, the poet W.B. Yeats, was seen as an ideal editor for Cuala Press, which had as its goal publishing Irish nationalist literature. Walkup noted, however, that W.B. was a “recalcitrant” editor, and Elizabeth had significant trouble obtaining material from him even as he chastised her for not making enough money. To help make ends meet, Cuala Press printed cards and a broadside series that included illustrations by her brother Jack. Despite continuing financial and familial challenges, during the 40 years she ran Cuala Press, Elizabeth guided the publication of more than 75 books and hundreds of pieces of ephemera, all printed on an Albion hand press. A centerpiece of the conference was the Albion press owned by William Morris and the Kelmscott Press, which was purchased and imported to the United States by Frederic W. Goudy in 1924. Known today as the Kelmscott/Goudy press, it is now part of the RIT Cary Collection. This was a fitting backdrop for Richard Mathews’s talk, which considered how Goudy, who admired Morris and was strongly influenced by the production values of the Kelmscott Press books, learned and worked in a way that was distinctly his own. Mathews contended that Goudy is an example of a particularly American-style private press publisher—one who was self-taught, hands-on, and who learned type design and printing by doing them. 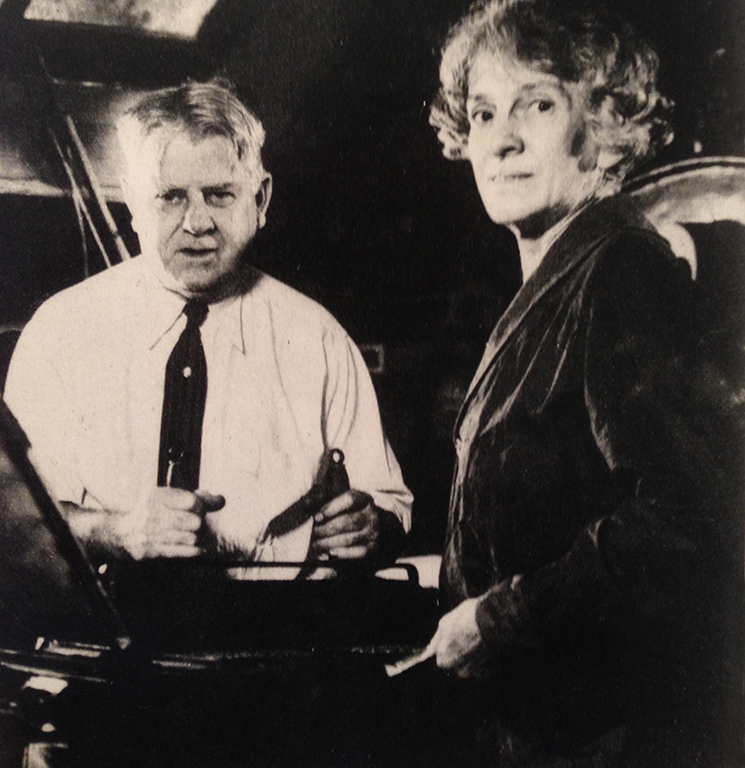 The photographs Mathews showed were an important part of telling the Goudy “hands-on” story. They included images of Goudy and Bertha at their printing presses, Goudy at work on each step of type design and typecasting, and a cast of Goudy’s thick hand. There was also a fascinating drawing by a “hand science” expert of a reading of Goudy’s handprint. It showed the qualities of ambition, will, creative ability, independent and practical thinking, and sensitivity. Sara T. Sauers is a book designer and letterpress printer who teaches at the University of Iowa Center for the Book. She was APHA's Vice President for Programs, 2014-2018.